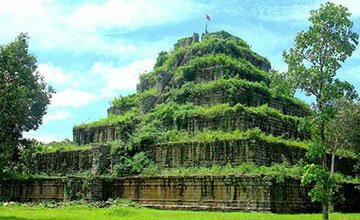 Sambor Prei Kuk is a very old, and rarely visited, temple located a four hour drvie from Siem Reap. 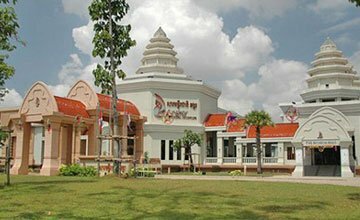 The nearby Kampong Thom City is an excellent place to spend the night if you want to enjoy a leisurely trip. 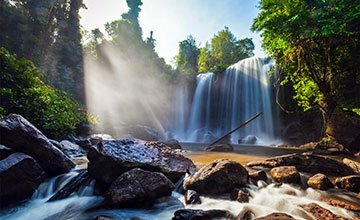 The drive itself is beautiful, a journey along the lush scenery of the Prey Preas River. Villagers in this area specialize in meals that include crickets, spiders, and frogs as well as sticky rice. The Sambo Prei Kuh temples were the second capital of the Khmer Empire and were built in the 7th Century by King Isanvarman I.
Spean Praptos is also known as Kampong Kdei Bridge on the National Road 6 from Siem Reap to Phnom Penh, used to be the longest corbeled stone-arch bridge in the world, with more than twenty narrow arches spanning 285 ft (87m). The bridge was built in the 12th century during the reign of King Jayavarman VII. It is one of the few Khmer empire era bridges to have survived to the modern day.